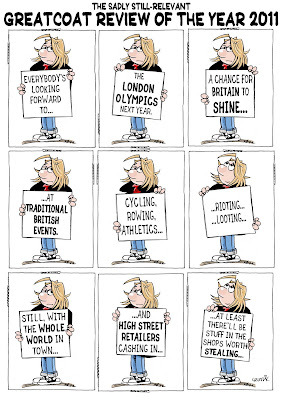 The Really Heavy Greatcoat by myself and Lancaster-based artist Nick Miller most recently appeared in Comics International, after being publishd for many years in alternative Lancaster titles such as On The Beat and Off the Beat and online on virtual-lancaster.net. Here's the cover to Issue 3 of STRIP Magazine, on sale in UK comic shops next month. 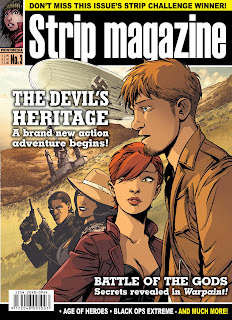 The Devil's Heritage is a new strip to the title, by Jerome Felix and Paul Gastine and the comic magazine's first ongoing story from continental creators. The story was first published in France by Bamboo as L'Heriatge du Diable. A mystery adventure set in 1938, the story opens with Paris-based artist Constant trying to find his lost love, Juliette - only to find a clue in a painting from the seventeenth century. But Constant isn't the only person intrigued by the mystery - the Nazis are very interested, too. Soon the hunt is on to find Juliette - and the key to an ancient secret at Renne-le-Chateau. "The myth of Rennes-le-Château is one many people are asionate about," says Jerome of the story, which will eventually run over three spearate adventures. "It reminds them of Tintin: there are coded parchments, secret passages, mysterious men... and tragic deaths!" • Can a shark expert put an end to Hook Jaw in our classic strip from Ken Armstrong and Ramon Sola? • Who is Bogey-Man Bob? The issue also includes interviews with comic creators Jason Cobley and John Ridgway - and a special retrospective feature on Starlord, 2000AD's short-lived stablemate, the comic that first brought Britain Strontium Dog! 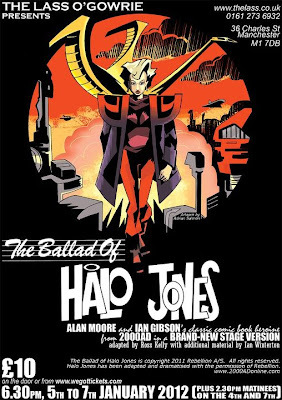 Here's the poster for the new Ballad of Halo Jones play at the Lass O'Gowrie in Manchester which we plugged recently. The art is by Adrian Salmon, who's been a regular contributor to Doctor Who Magazine for many years, and he's posted the original art and its creation process on his blog. Merry Christmas - Don't Eat Too Much! 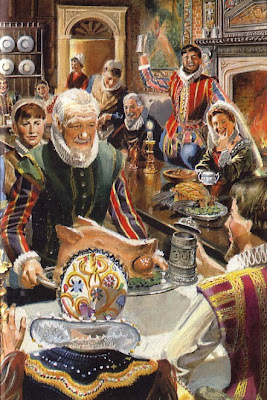 As you sit down to your Christmas dinner, or alternatively are recovering from it, we couldn't resist showing you this illustration of a Christmas meal in Tudor times taken from The Stories Of Our Christmas Customs which was first published by Ladybird in 1964. If you think the bearded gentlemen serving the boar's head looks a little familiar that is because the artist for this book was Dan Dare creator Frank Hampson and the model he used for the man was his father, Robert 'Pop' Hampson, who was also the basis for Sir Hubert Guest, Controller of Dan Dare's Space Fleet. I wonder how many Dan Dare fans realised the similarity at the time?